To quote @SraSpanglish, “Is it just me, or has #langchat been increasing in awesomeness the last couple of weeks?” Last Thursday night, Langchatters were at it again, sharing advice in a whirlwind of tweets until their phones and laptops gave out on them (@SenoraCMT: “Phone battery dying! Time to say goodnight!”; @Marishawkins: “Another great #langchat and my laptop battery is dead!”), and participants were feeling the #langchat love (@MmeFarab : “The #langchat community makes me feel so loved/supported”)! The conversation focused on how instructors can increase their use of the target language in the classroom, especially with novices. In case you got lost in all of the tweets, your weekly #langchat summary has got you covered! Thank you to everyone who participated last Thursday and a special thanks to our moderators, Colleen (@CoLeeSensei), Cristy (@msfrenchteach), and Kris (@KrisClimer), and Sara-Elizabeth (@SECottrell), for managing yet another lively #langchat! Increasing use of the target language (TL) in your classroom can be a challenge, and Langchatters were eager to discuss challenges and share valuable tips! Langchatters commiserated on the difficulties faced by those who strive to increase instruction in the TL. 7. Staying Energized: Coffee, anyone? Instruction in the TL requires a lot of energy. Many teachers commented on the need for adequate rest and plenty of coffee to ensure they have the energy needed to meet TL teaching goals. 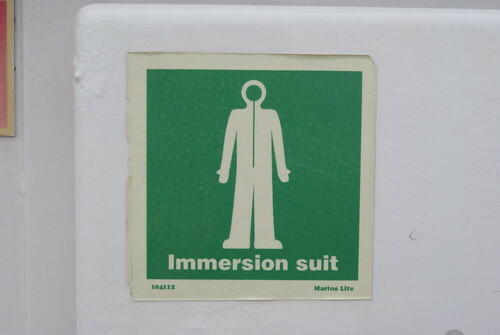 Ready to put on your immersion suit? Here are some tips! In addition to highlighting some of the challenges that instructors face in providing students with a good deal of instruction in the TL, Langchatters offered useful tips for those ready to take the dive! Kris (@KrisClimer) shared some resources to get the conversation going. Langchatters were quickly off and running, eager to share strategies and words of encouragement with their fellow instructors. Here’s what they had to say! 2. Establish Common Classroom Vocabulary: @Thecrazyprofe wrote, “I taught them instruction words (write, explain, etc.) at the beginning of the year. Rarely have problems giving directions” and later added, “I have these common commands printed [with pictures] and posted above the board! These are important.” @SraSpanglish establishes core classroom vocabulary, which she uses and primes her students to take up: “ if I focus on the 10 basic verbs, it’ll encourage them to use language within their grasp [as opposed to relying on a] dictionary.” She notes that they “can do almost anything [with] gusta, quiere, tiene, es/son, necesita, hay, va.” @senoraCMT replied, “that was a GREAT change in my class! Ditching the dictionaries! Much better circumlocution and use of TL.” Instructors can model circumlocution in the TL and encourage their students to work with the resources at their disposal. 4. Make TL Use a Contest (for students and yourself! ): Make TL use a game in your classroom (i.e. Who can keep it up longest? )… with consequences. Some teachers have implemented a “pay me” system, which requires students to hand over classroom money when caught speaking English. Other teachers take part in TL contests of their own by timing themselves with a stopwatch to see how long each class can have their teacher stay in TL. @HolaSrHoward also uses competition: “my classes compete to see how long they can stay on task while I’m in TL.” Check out some sample results that he shared: https://t.co/FN6WrvuX1I! Of course, you can always hold yourself accountable. One teacher mentioned that she promises to bake brownies if students can catch 10 instances of the teacher’s English (non-TL) usage during a class. 5. The English box… Yes, you read that correctly! The English box seemed to merit a comment in its own right. @Portenogringo wrote, “Next year I’m going to use an ‘English box’…a corner in the room. If English is needed, gotta stand in the box.” It quickly became apparent that @Portenogringo was not the only one with an English box in the classroom. @SenoraWienhold commented, “we have an English box in my room. Worked well for a while but have to be consistent.” It seems that even the presence of an unused box can make a statement! @MmeFarab chimed in: “Yes! I actually have the box on my floor right now, not using currently. Though the box gets a lot of attention.” Going to step outside of the TL, instructors? Consider relegating English (literally) to a corner in your classroom. Langchatters provided useful strategies for language teachers looking to increase instruction in the TL. They emphasized the importance of not only keeping input comprehensible, but they further encouraged instructors to foster an environment in which students feel comfortable voicing confusion. Instructors were called upon to be dramatic in the TL and to challenge themselves to use it as often as possible, with consequences for letting down their guard. More than anything, Langchatters remind language teachers to be patient with themselves and with their students. If you’re keen on increasing your use of the TL, take it easy! Langchatters agreed that we must not strive for perfection: “Remember this goal: be better today than you were yesterday. Perfection is not the goal!” (@placido). Thank you again to Colleen (@CoLeeSensei), Cristy (@msfrenchteach), Kris (@KrisClimer), and Sara-Elizabeth (@SECottrell) for moderating another fast-paced discussion. Due to space limitations, many tweets had to be omitted from this summary. To view the entire conversation, you can access the full transcript on our tweet archive. If you have any comments or questions that you would like to share with the #langchat community, do not hesitate to do so. Please send us your ideas for future #langchats so that our weekly discussions can become as relevant and inclusive as possible!